The individual venues identified for this study were selected because they met two criteria. They had to be open to the public and be distributed throughout the country. Consequently, the study was then focused on public libraries, telecenters, cybercafés. 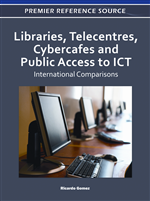 Public libraries and cybercafés are widely distributed, while telecenters were considered because they are oriented toward underserved communities and groups.